Heat oven to 400°F. Spray 9-inch glass pie plate with cooking spray. 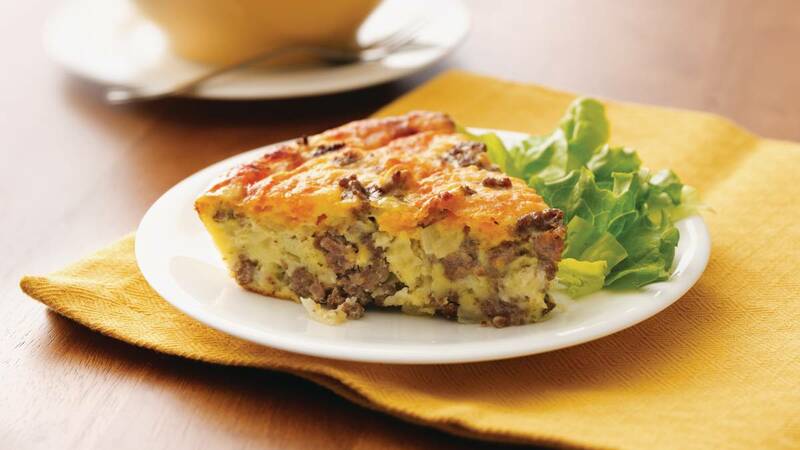 In 10-inch skillet, cook beef and onion over medium-high heat, stirring frequently, until beef is thoroughly cooked; drain. Stir in salt and pepper. Spread in pie plate; sprinkle with cheese. In medium bowl, stir Bisquick™ mix, milk and eggs until blended. Pour into pie plate. Bake 25 to 30 minutes or until knife inserted in centre comes out clean. Make Ahead Savoury Impossibly Easy Pies can be covered and refrigerated up to 24 hours before baking. You may need to bake a bit longer than the recipe directs since you’ll be starting with a cold pie. Watch carefully for doneness.